Hands up if you’ve stopped checking the weather on your television in favor for the app in your phone. It might have been years, but you’ll probably want to pick up your remote the next time around. 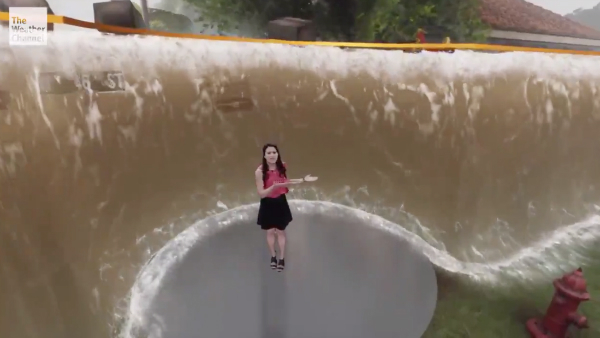 Taking the mundanity out of weather reports, The Weather Channel has impressively incorporated mixed reality to illustrate the gravity of Hurricane Florence floods. Here, in-house meteorologist Erika Navarro is seen gesturing in coordination with the terrifying graphics. She talks about the floods being able to lift up cars, describes how they might go “above my head,” and imagines fish swimming in the waters. “Eat your heart out, CNN!” tweeted BuzzFeed writer Dorsey Shaw. His post has since garnered over 23,000 retweets and nearly 60,000 ‘likes’. Computer visuals aside, many applauded Navarro for her “Emmy-winning” performance in the segment, as well as the backstage crew’s efforts in creating the video, which apparently took only two days to put together. “I watched this three times in a row, each time thinking more about the sequence of meetings by set designers, video graphics animators and producers that must have happened in order to result in this,” said William Gruger, senior manager of music platform TIDAL. Back in June, the network created an equally immersive graphic depicting possible effects of a tornado, and had a car flung towards the host, who cowered in return. It’s safe to say that learning about the weather will never be boring again. Check out the clip below, which will undoubtedly knock your socks off. A wind fan to blow her hair at the 9ft level would have killed it. "we need to feel more like we're IN the hurricane flood, how can we do that?" "are the fish assets in?" they had 2 days to do this. Love her hand motion raising it up. Powerful performance. Emmy winning stuff.